Y-PEER is a global youth peer education network of organizations and institutions has been pioneered by UNFPA in 2002 and is working in the field of youth work in 52 countries throughout the world. The network envisions to unite youth towards safer, healthier and just society. Y-PEER promotes the equal access to opportunities and fights with discrimination based on gender, sexual orientation, serologic status, physical capacities and disabilities, political and religious views, ethnic or national origins, disability or chronic illness. As part of global network, Y-PEER Azerbaijan aims to empower and build capacity of young people to transform the situation of destructive conflicts, all kinds of violence, discrimination, gender inequality, and improve physical, sexual and mental health through peer to peer education. Y-PEER Azerbaijan is looking for short-term SMM specialist. The work will be part-time in contact with local team in Baku, Azerbaijan. Good command of English and Russian; native in Azerbaijani. 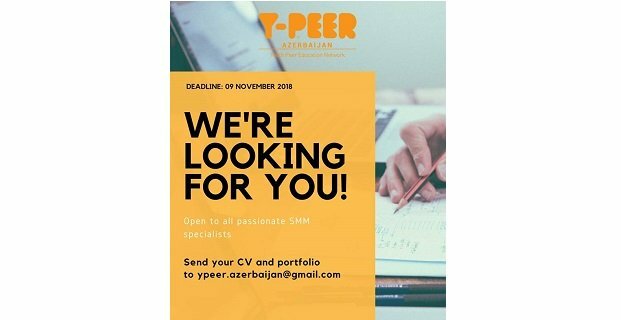 Please send us your CVs and portfolio to ypeer.azerbaijan@gmail.com email no later than 09 November 2018. If you have any questions please do not hesitate to contact us.